We are an eminent manufacturer and trader of a comprehensive range of contemporary and latest design Queue Barrier. These are highly used in malls, complex, halls, ceremonies etc. 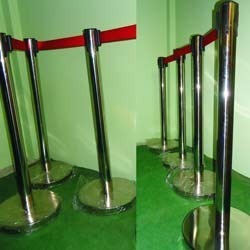 These are used as a prominent barrier to manage the crowd in the form of queue, we make them available as per international quality standards to suit the needs of domestic and overseas clients with ease. Looking for Queue Barrier ?